It was a big issue for me, when I was traveling and a constant worry in the back of my mind. 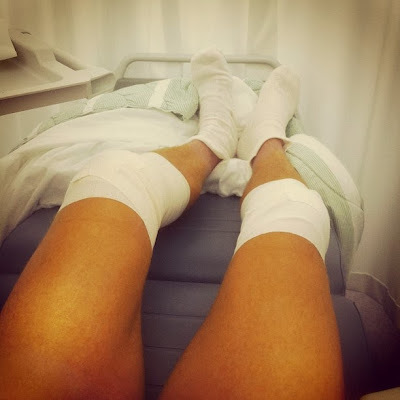 A few years and lot of De La Riva guard later, I had accumulated even more little injuries, and while waiting for another injury to heal, I decided to have surgery on both knees and get it all done at once. It's been a week since my double surgery now, and my knees are healing up day by day. I can walk pretty normally already and should be able to be back on the mats in 2-3 more weeks from now. It's frustrating to be sidelined, but at least the rest of my body feels pretty good at this point (back, shoulder and what else injuries I've been battling). So hopefully, when the knees are healed up, I can really get back in action. Given that you had surgery on both knees, what are your plans to stay in shape? Furthermore, what about Jiujitsu, will there be zero jiujitsu until your 100% recovered or do you have a plan in mind to work around the injury? A well written admission essay could get you into your desired school and make a difference for your life, so you want to make sure your chosen admission essay writing service is one of the best out there. It is strangely open-handed with people like Pakar Seo to provide unhampered what numerous people would have marketed as an electronic book to help make some profit for themselves, mostly seeing that you might well have done it if you desired. Those good tips Master Seo from like wise served like Pakar Seo a great way to be aware that someone else have similar dream just as my very own to know the truth a great deal more when it comes to this problem. Certainly there Pakar Seo are numerous more pleasurable times ahead Pakar Seo for those who look into your master seo site. agen sbobet really helpful and has continuously helped guys terbaik like me to realize their desired goals. agen sbobet Your own useful information entails a great agen sbobet deal to me and even more to my colleagues. Regards; from each one of us. give a call and let our experts know the type of girl you want. We have girls belonging to different nationalities who are friendly and look really amazing with their ultra-modern dressing style.